A few days ago Amazon posted some details of their big sellers over the holidays. The biggest news to come from that press release was the fact Amazon's Kindle and Kindle books were the biggest sellers, wherein Kindle books sold more on Christmas day than their physical counterparts - which honestly makes a whole lot more sense then people are giving credit for. Of course they sold more, what else would you do with a Kindle that you just got? Go out an buy a physical book? Not very likely. 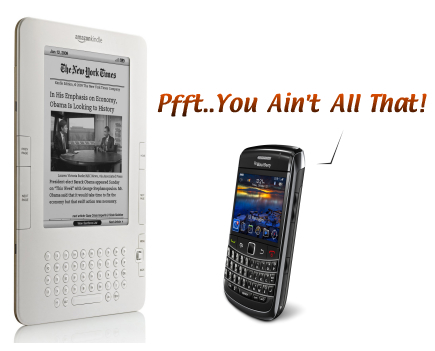 However, if you looked further down the list of the highest selling items for the holidays you would have noticed that the AT&T BlackBerry Bold 9700 was the hottest selling device in the "Wireless" category with cellular service. The only item ahead of the BlackBerry Bold 9700 when speaking of devices was the Nokia 5800 XpressMusic which was sold sans contract and unlocked. Not too shabby if you ask me, I bet AT&T and RIM were glad to see that happen - I just wish Amazon would have released some numbers to go along with it to give us a better sense of volume.